Hello Anglers! We welcome everyone a warm Island greeting from the Saltwater Angler! Moderate winds out of the ENE for the next few days will make for a great window of fishing opportunity. Then New Year's Eve we are expecting a pretty significant cold front coupled with high winds to move in for a few days. Things will slow down in the back country as our typical winter weather patterns kick in. We are still getting some great reports of Bonefish still being found to the west of Key West. Remember that on the warm days, the flats will warm up and offer some shots at permit even through the winter. Also on the flats, large schools of rays bring with them a wide range of Jacks. Pound for pound the crevalle jack is the hardest fighter on the flats, so hooking up to fish that big is no walk in the park. To the East of us back in the basins Trout and Cudas are finally starting to wake up and feed like normal. Look for the water mixed up with puffs a mud, which should give you a chance at large Jacks or Trout. Sharks, Cudas and Snapper are relatively easy to find drifting over deeper basins in the back country and ledges just off the flats. The Yellowtail snapper fishing will continue to be very good just off the reef in 40-60 feet of water. The Tuna bite has been excellent over the past month and will probably continue as the North winter winds push more and more bait off shore. Many captains are reporting large schools of Tunas both to the east and west of Key West. Loading up the live well with fresh bait is the key to success for Tuna. Remember keeping a rod loaded with your favorite top water plug on a wire leader could reward you with a chance at a Wahoo or Kingfish! 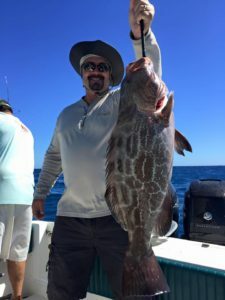 Remember that Grouper season is coming to a close January 1st. Jigging with live or cut bait can really put you into a fight with one of these brutes! As always...This is the Saltwater Angler wishing you a great Holiday, tight lines and fish boat side!! !